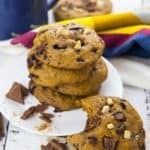 These vegan pumpkin cookies with huge chocolate chunks are the perfect treat for cold fall days! They’re super easy to make and they’re so incredibly delicious! Are you pumpkin fans like me? Starting in early September, I just get into that pumpkin mood and I can’t get enough of pumpkin! I already made pumpkin curry, pumpkin lasagna, pumpkin hummus, and pumpkin bread this year. Oh and of course pumpkin soup and pumpkin spice latte with almond milk. Yummy! I can never get enough of that! 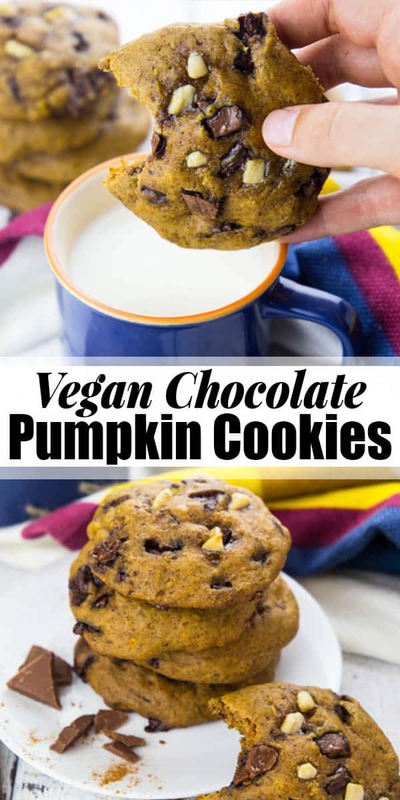 So of course I also had to make vegan cookies with pumpkin. This time in combination with vegan dark and white chocolate chunks. 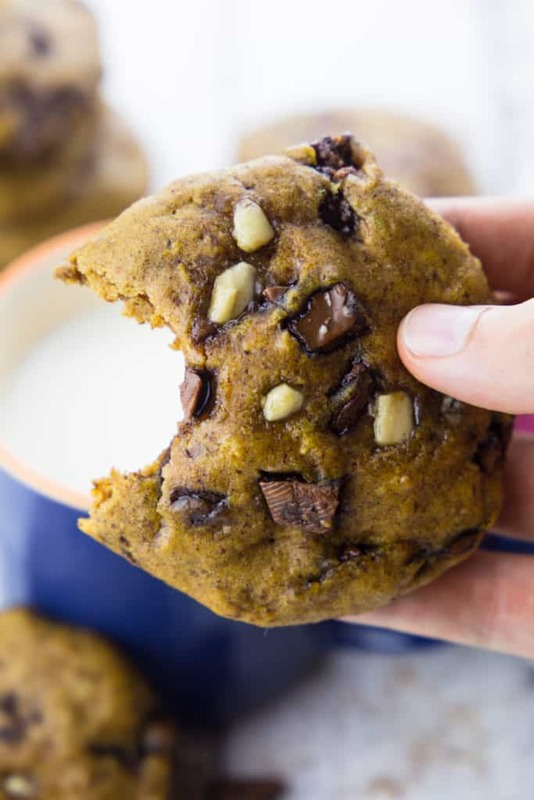 But attention: These vegan pumpkin cookies are super addictive! Haha! They’re usually gone SO fast in our house! But who’s there to blame? They’re just so good! And my hubby sure loves his cookies! As always, you can find the full ingredient list and the recipe in a separate recipe box at the end of the post. The recipe really couldn’t be easier. 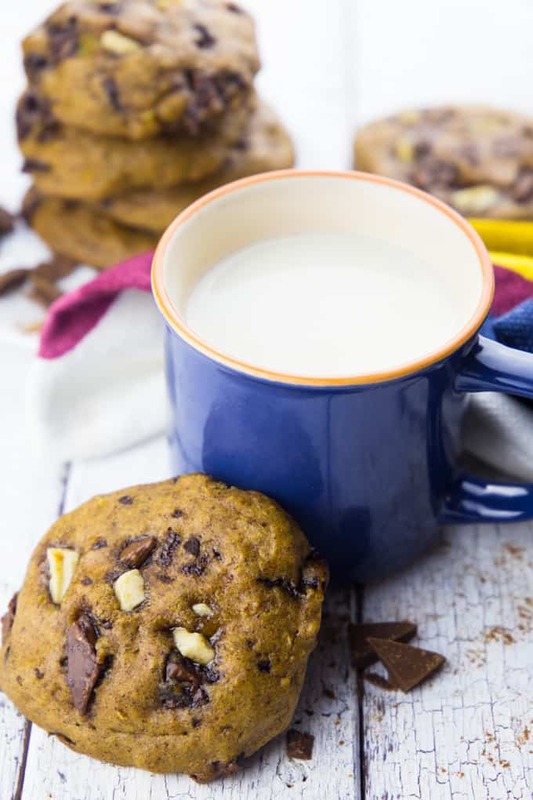 You just combine all ingredients in a bowl, line a baking sheet with parchment paper, and form the dough into cookies. You can either make 12 normal sized cookies or you can make 6 jumbo cookies. I went for the jumbo cookies this time. They turned out so fluffy and soft! 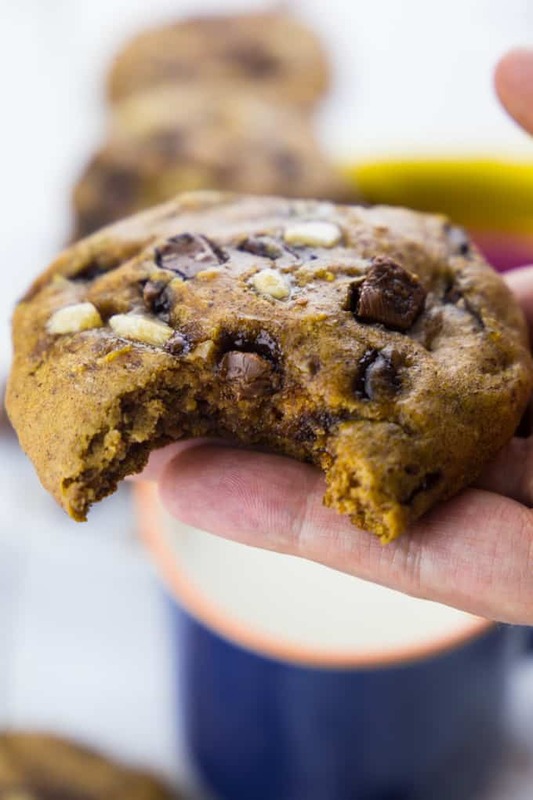 And how I LOVE that smell when you make these vegan pumpkin cookies. Your whole house will smell like pumpkin spice. No scented candles needed! Just make pumpkin cookies instead. Haha! 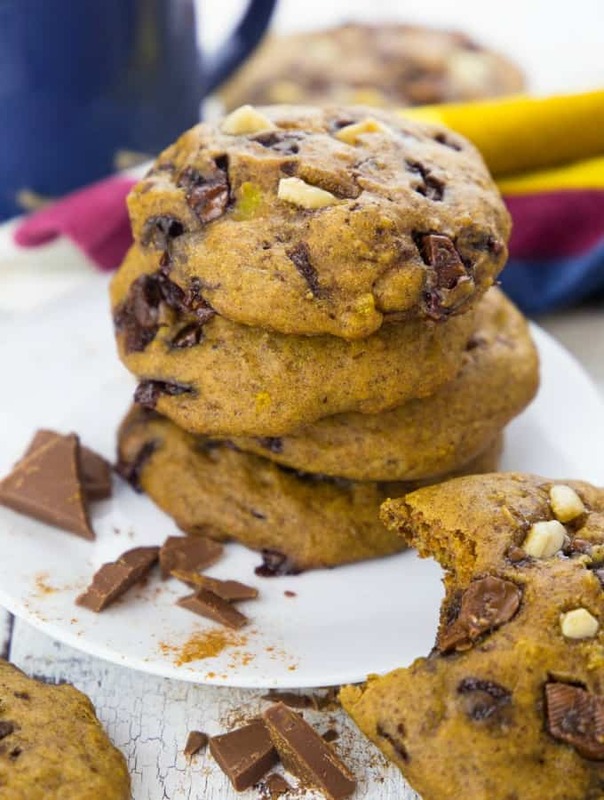 I hope you like these vegan pumpkin cookies as much as I do! 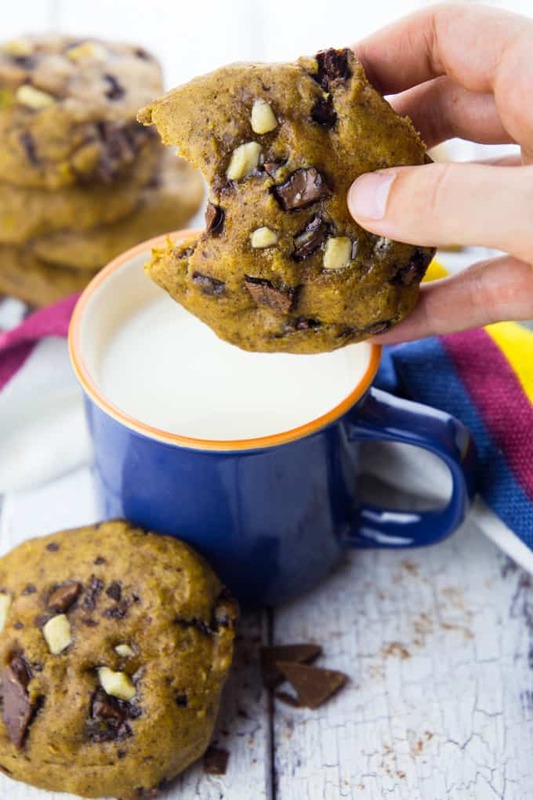 These vegan pumpkin cookies with huge chocolate chunks are the perfect treat for cold fall days! They're super easy to make and they're so incredibly delicious! In a large bowl, combine all ingredients and stir with a wooden spoon. Line a baking sheet with parchment paper. Using a spoon, either form 12 normal sized cookies or 6 jumbo cookies. Bake for 10-12 minutes. Let the cookies cool down before you eat them. Enjoy!